My next LinkedIn Challenge starts in September 2017. Sign up to join the Priority waitlist <<HERE>>. Every day for 10 days, you will get an email with a short video and a worksheet with a bite-sized task for the day (plus a ‘when you’ve got more time‘ extension task too). You’ll get invited to a private Facebook group where you can share your thoughts, ask questions, get feedback and be inspired. In the meantime I’ll add you to The Confidence Guide which is published weekly, jam-packed with tips and tricks for ambitious women who want clarity and confidence. And we’ll talk again when the LinkedIn Challenge starts in September. Click <<HERE>> if you want to get noticed on LinkedIn today! 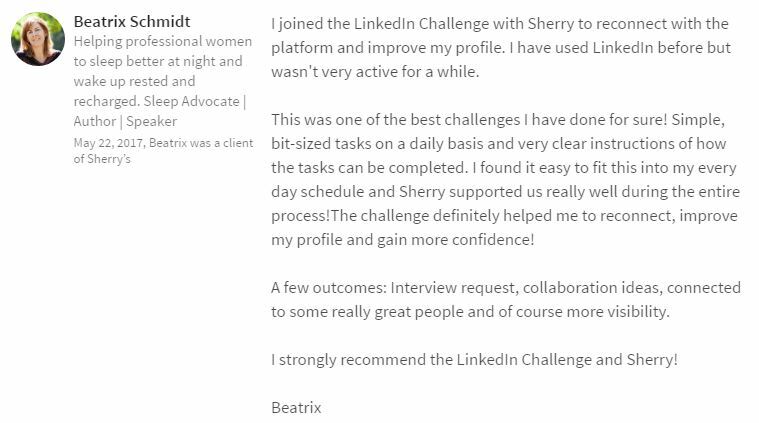 If you know already that you want more personalised help than you’ll get from a (free) 10 day challenge, or you want to get started right away, a one-to-one personalised LinkedIn Profile review could be what you’re looking for. Find out more here. Ready to get started? Join the priority list today so you don’t miss a thing when we start on Monday 18 September. I can’t wait to share my knowledge and insights with you and hopefully you’ll learn to love LinkedIn as much as I do.